A hot air balloon ride has always been on my bucket list. It was one of those adventures at the back of my mind, something I would do someday, somewhere at the bottom of my list. Something I always wanted to do but for many reasons, never actually did. It's too expensive... there isn't a lot of it here... I am terrified of heights.... and on and on. 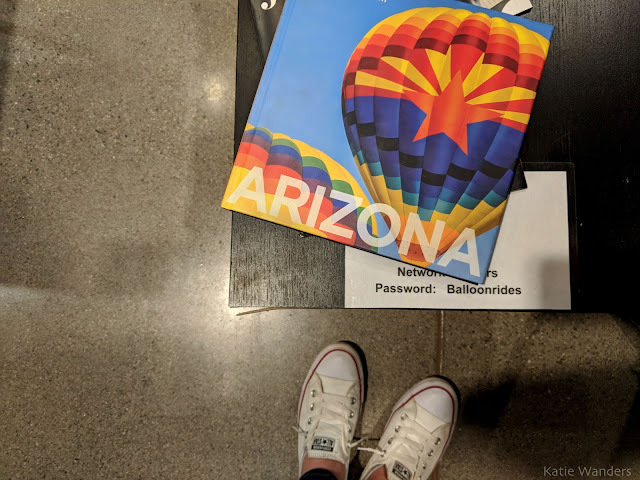 When I had to chance to visit Arizona, and one of the activity selections was "hot air ballooning" I couldn't believe my luck. Heck, I even passed up on whitewater rafting to wake up at 4:45 am and meet a bunch of strangers in a field somewhere in Arizona. 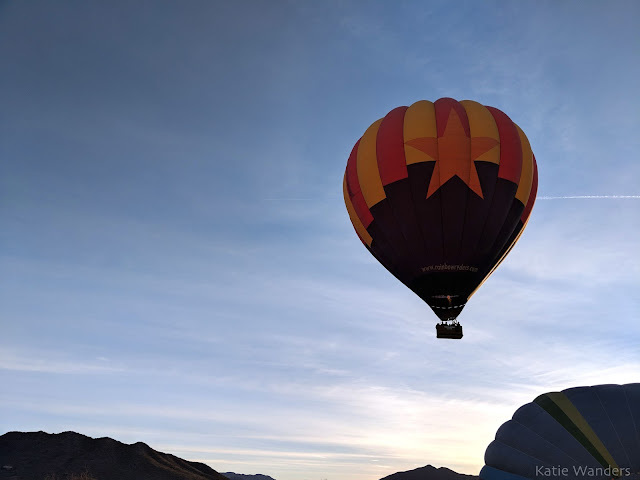 A Sonoran sunrise as seen from a hot air balloon - I finally had my opportunity to cross another item off the bucket list and step inside the basket of a hot air balloon. Man, was it nice to be in the warmth of the desert. After a week in Banff, spending my 30th birthday in negative-something-degrees, I was looking forward to - hell, I needed a week of warmth and sunshine. And let's be honest, it is so much easier to pack shorts and tank tops than thermals, snow pants, and puffy coats. After landing in Arizona, I embraced the sunshine and tolerated the chilly night famous to desert life. But in the morning, it was shorts and sunscreen as we headed out to our first excursion of the trip. The desert was never high on my radar as a tried and true New Englander with a love of the ocean. But travel enough and you can change your opinions on just about anything. Truth be told, Utah is where I first fell in love with the desert and yes, most people forget that Utah is in fact, a desert. This big state has a climate that varies from snow covered mountains to dry arid desert. In fact, about 33 percent of Utah is true desert (average annual precipitation is five to eight inches). 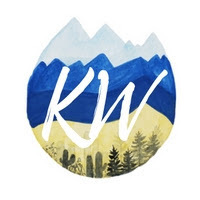 It was in Utah that I really experienced my first desert, hiking among the slickrock of Moab and spending nights under a million stars at a quiet campground in the sand. The last post of a series is always the best and saddest. It's the best because I have already spent weeks recapping an amazing trip, detail by detail from what I did to what I ate. 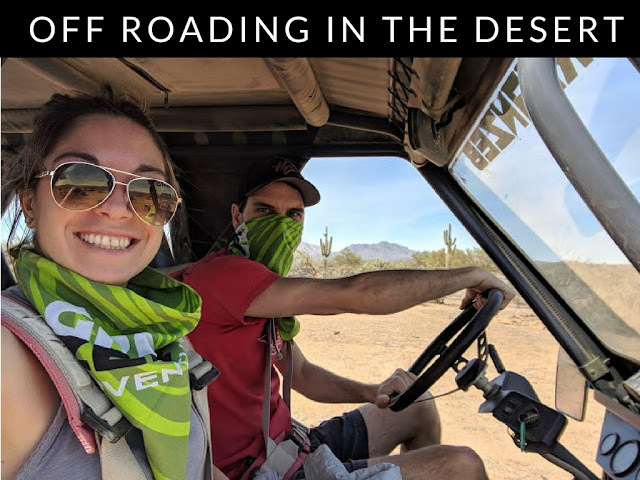 I also get to share a fun video so you can see for yourself just how amazing these places are. Sad because I can no longer talk about this beautiful destination and the amazing outdoor activities in the area. But with one return flight home comes another trip planned somewhere else and this month was no different. After landing back in the U.S. A I was on a plane next week for the American Southwest. But before we get into saguaros and sunshine, let's talk about snowy Banff National Park one last time. 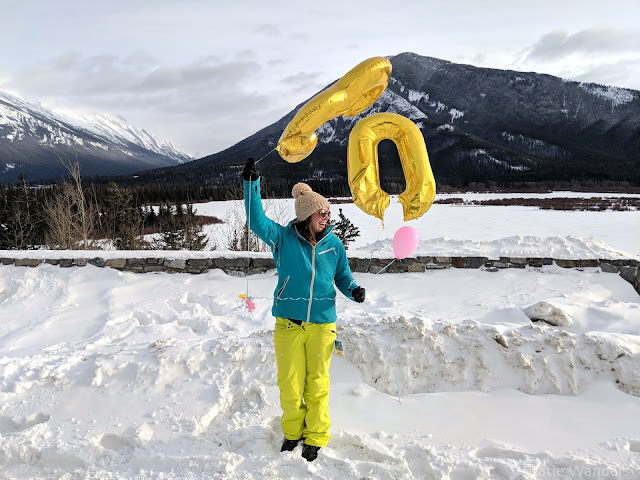 I bet you now by know my trip to Banff National Park in the wintry month of February was purposely planned to celebrate my 30th birthday. I wanted a unique destination, affordable pricing, and to see somewhere as beautiful (and popular) as Banff in one of its quieter seasons. 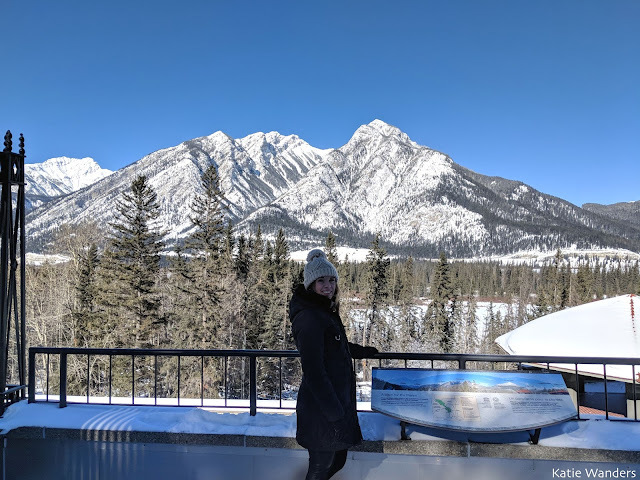 If you still need some convincing as to why you should head to Canada in one of her coldest months, then here are six reasons why. If you are sold and want to see the beauty of Banff under a thick layer of snow, keep reading as I share fun facts on the park and area, information on getting to Banff, need to know details, and what I spent for 6 days, 7 nights in Alberta. It was a whirlwind week in Banff National Park. 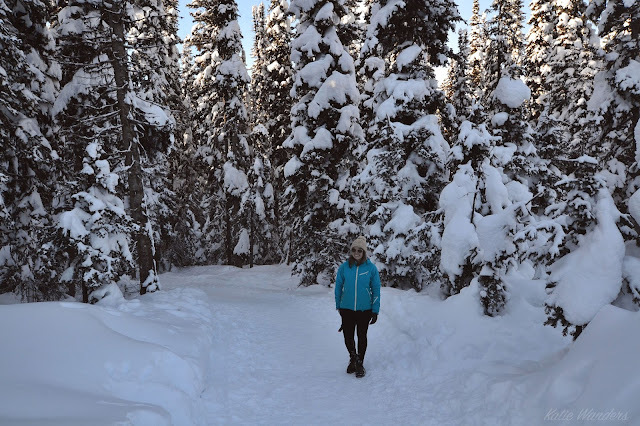 From three days of skiing, scenic drives, snowshoeing, ice walks, to dogsledding, we had seen a lot of different angles of this beautiful area in a short window of time. 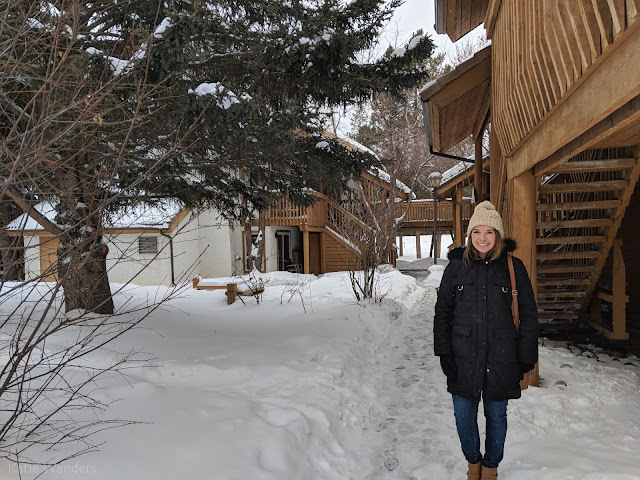 Our last day of Banff was pretty open, stopping to see some of the museums and in Banff before making our way back towards Calgary where we would hop on a plane and head back for the states and temperatures above zero degrees. 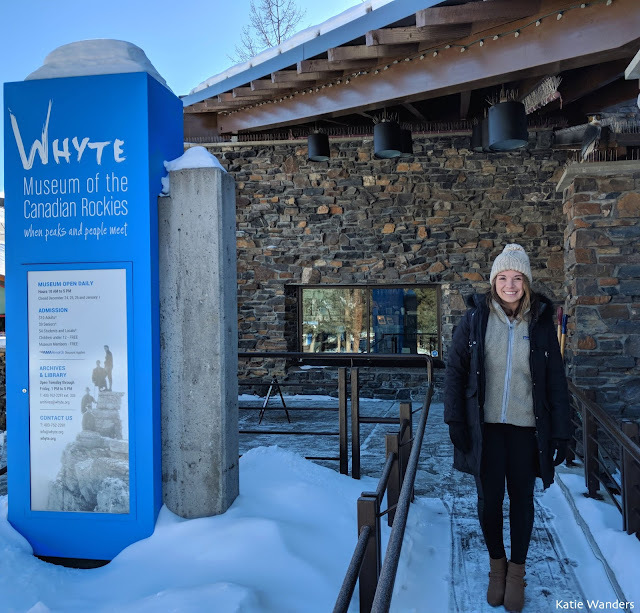 We were up early, packing up the rental car with our ski gear and luggage with plans to stop at the Whyte Museum in downtown Banff and the Cave and Basin National Historic Site, famed to be where Canada's National Park system began. Due to some lack of planning on my part, we pulled into the Historic Site to discover the visitor's center and cave was closed on Monday and Tuesdays. We enjoyed the view and stretched out legs before jumping in the car to head to the Whyte Museum. When I planned my 30th birthday in Banff and started to tell my friends, about my upcoming travels, I kept getting the same response over and over. It went something like "That is awesome, I have always wanted to go to Banff... but in the summer". Sure, Banff is insanely alluring in the summer with its sunny skies, turquoise lakes, and comfortable temperatures. 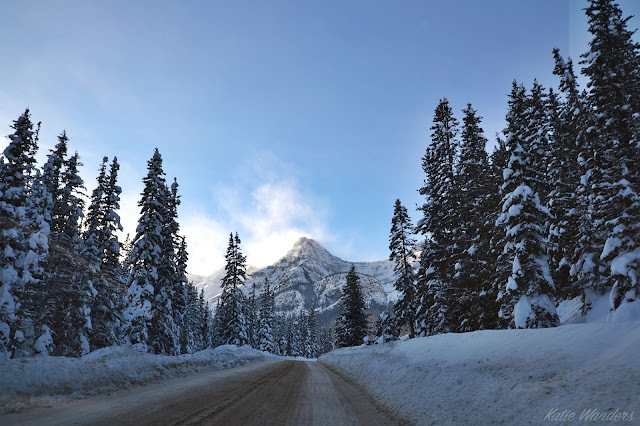 But in the winter, Banff is an quiet winter wonderland that should jump to the top of your bucket list. And maybe, right before "visit Banff in summer". 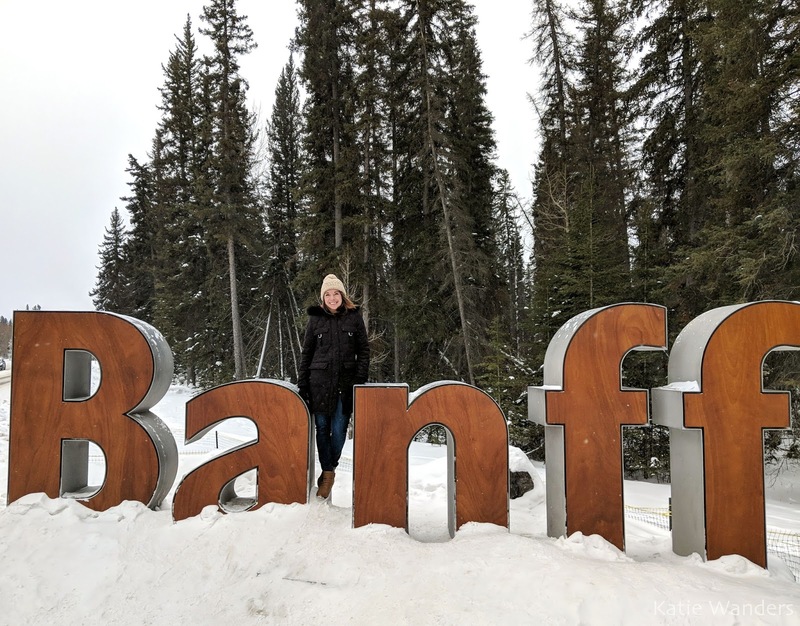 There are so many reasons you should visit Banff in the winter, ranging from scenic snowy peaks to budget-friendly options but for the sake of time and typing, I am going to focus on the Big 5. Banff is famous for its turquoise lakes and wildflowers. But Banff needs to be see with its white peaks and snow covered roads. When I visited in January, it felt like every day a light dusting of snow coated the landscape. 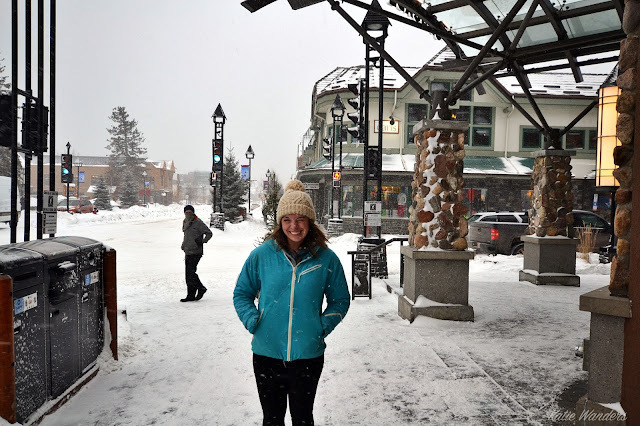 You start to feel like you are living in a snow globe featuring the most picturesque mountain town. There is something about a blue bird day and crisp white mountains and trails that makes a winter day so darn beautiful. Winter in Banff reminds you just how beautiful those cold months between November and April can be. Banff is a town within a National Park. Because of that, growth is regulated and currently, the town isn't getting any bigger. What that means is while this place gets more and more popular, the lodging gets more selective and more expensive. But in the winter? Not the case. There are more options for lodging and they are much more affordable. A room in this resort was $100 a night in the winter, and $255 a night in July. Its also already mostly booked up for the summer. If you are on a budget - Banff in the winter is your best option to see this National Park. Want to photograph beautiful Banff without all the people? Winter is your friend. The streets are quiet and you can walk through downtown without the masses or 54 tourists in the background. This also means you can easily find a parking space and wont have to worry about traffic backing up on this road through town. Terrified of grizzlies... or maybe just hyper aware (as you should be)! Want to hike without worrying about these types of interactions with mother nature? Go while the bears are hibernating of course! This may seem silly but it is peace of mind to be in the woods of Canada and know the wildlife threats are greatly reduced. If you are lucky, you may see some tracks in the snow in the morning. But you wont have to worry about crossing grizzlies on the trail. In the winter, you can see some of Banff's most popular sites without all the crowds. You can hike some of the most popular trails without seeing a single person. You can make a reservation at the best restaurant in town without calling two months in advance. I know I keep hammering the "less is more" in terms of crowds but for me, less people always means a better experience. 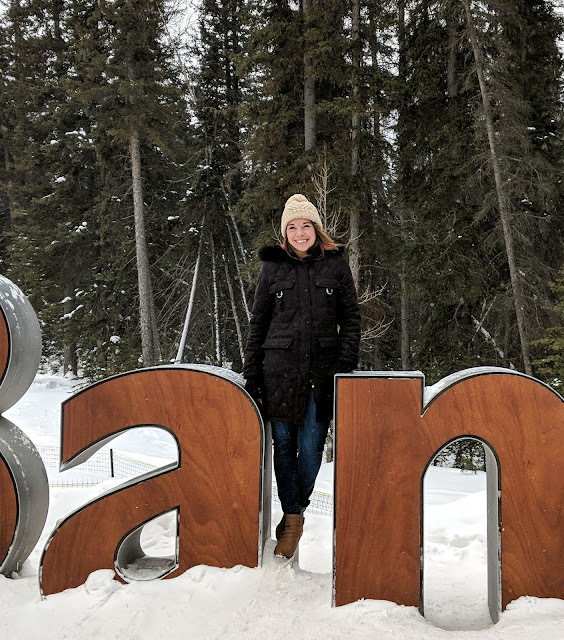 Experiencing some of the most popular sites in Banff without all the crowds is one of the biggest perks to visiting this town in the winter. My last point is the most obvious but is so important. Visiting Banff in the winter allows you to experience world class skiing at three different resorts. You get to experience this beautiful National Park, and get some runs in - does this really need any more explaining? And then theres dogsledding. 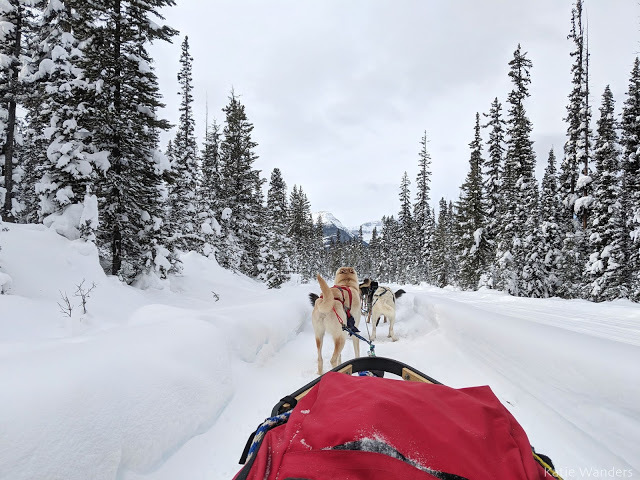 You only have a short snowy window to experience just how magical it can be to spend a quiet morning behind a dog sled making your way through the National Park. 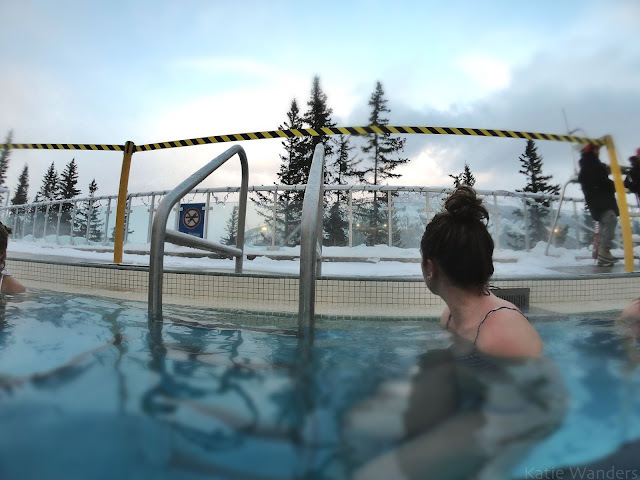 If you are looking for a reason to visit Banff in the winter, there are many. World class skiing, budget friendly options, solitude, and of course famous snow. The skiing, affordable price and the solitude was the reason I visited Banff in January instead of in its more popular seasons. As much as I would love to see Banff in the summer, I have this lovely idea of a quiet ski town in my brain that just may stay like that forever. Lake Moraine, you can keep your gorgeous color, I just might keep visiting Banff in the winter, so I can have the park to myself.